Marcia expressed this statement as she picked handfuls of the red coffee “cherries” from the branches on that misty January day as we stood on top of a cloud enveloped mountain in Honduras. Fifteen of us had ridden up the winding dirt road in the double cab and bed of a 4×4 pickup truck to meet Juan and his family. 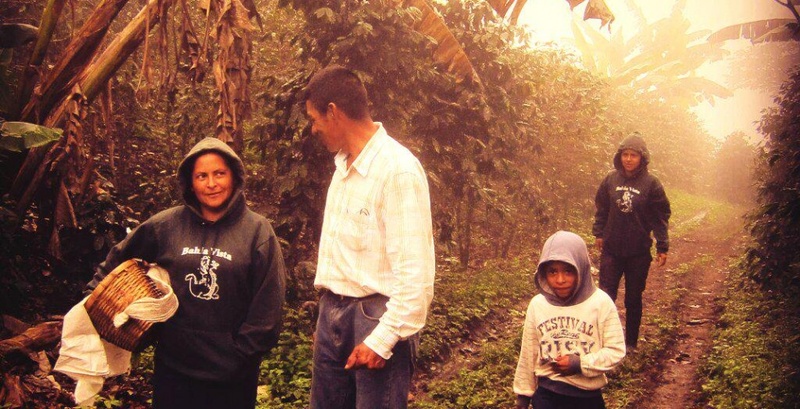 They led us up the mountain path lined with coffee and banana trees and pointed to a narrow path leading up to the top of the mountain where the coffee needed to be picked that day. We tried our best to wedge our shoes into the steep muddy path and find enough leverage to climb up the pathway without damaging any of the rows of coffee plants that lined the mountainside. As we emerged at the top of the mountain, a foggy outline of a few eucalyptus trees were visible as they towered above the man-sized coffee trees.